Travelling by car is surely the very best way to discover and appreciate America – its vastness, its wilderness areas, its wonderful natural landscapes and its dynamic, dramatic human history. 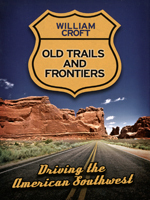 A veteran of many road trips across the USA, William Croft records eight spectacular drives through the American Southwest, from the blue Californian coast to the arid deserts of the Great Basin, the jaw-dropping canyons of the Colorado Plateau and the dizzy altitudes of the Sierra Nevada. Colour photographs offer a taste of what is in store for the intrepid driver, alongside fascinating insights into the human dramas played out against these awesome natural backdrops. An inspirational read for lovers of the open road and armchair travellers alike.